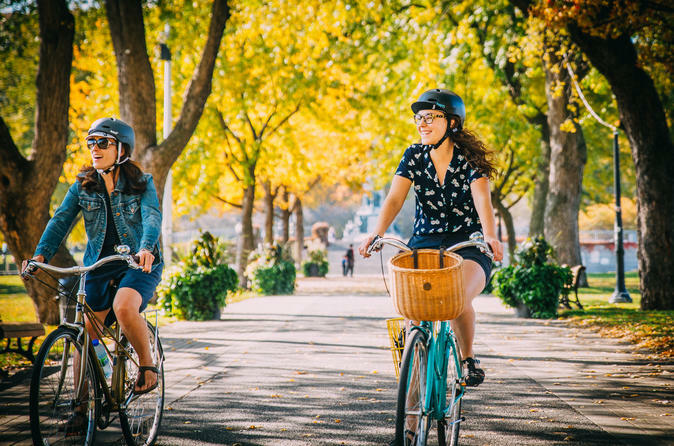 This 3-hour North City bike ride ventures deep into the vibrant, eclectic, must-see ‘hoods of the Plateau, Mile-End, Little Italy, and Mile-Ex. You will ride parks, quiet streets and laneways, spot murals and street art, and visit the Jean-Talon farmer’s market. A real taste of authentic Montreal lifestyle! Even locals have discovered many things not seen before on this route. This tours includes a comfy yet stylish bike, helmet (optional) and water bottle. The north city circuit will immerse you in the local hangouts of the city’s hippest inhabitants. Concentrating on the vibrant and eclectic must-see neighborhoods north of the downtown core, you'll discover the incredibly diverse Plateau Mont Royal, artsy Mile End, up and coming Mile-Ex, and traditional Little Italy. After meeting at the departure location, you'll be fitted to your stylish city bike and helmet (optional), and meet your guide for the ride. You’ll zig and zag through narrow streets, ‘green lane-ways’, cafe-lined boulevards and spacious parks to make sure you won’t miss a beat. Along the way your guide will point out some impressive murals that form part of Montreal ever evolving street art scene. You will learn how the different communities and characters of each area have shaped its history and culture while discovering some of the city’s culinary delights, including the overload of local food & produce at the Jean-Talon farmer's market, North-America's largest open-air market. This ride is an authentic Montreal lifestyle experience.